Ascending along Camí Alfatara, we come upon the grandiose Diluvi Olive Tree, unique in Dénia. The name is believed to refer to the biblical “Universal Flood” ("diluvi" in Valenciano), given the age of the tree: between 700 and 800 years, with a height of 9.5 m.
The trunk's diameter at the height of 1.3 m is of 2.39 m. It has a large hole in its centre, and splits into two, main branches. Its shapes and rugosity make it an impressive living, natural sculpture, representative of centennial specimens. Refer to the informative panel. This fortified home, built between the 16th and 17th centuries, lies at the end of the ascent. 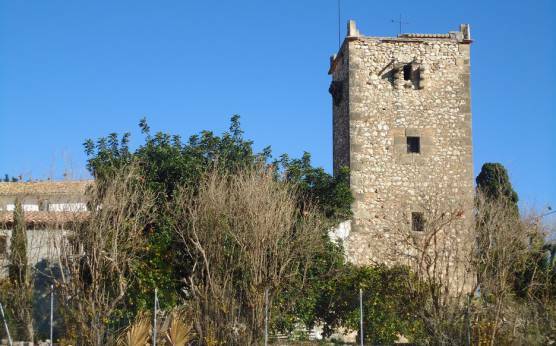 Its prominent square tower and four heights, where the inhabitants of both the house and the area sought refuge for protection unto the incursion of pirates or their own social riots. Its strategic location permits watching over a wide, territorial expansion. The complex is completed by another 4 living spaces. The chapel with a bell tower is worth pointing out, which has a semi-circular arch of rough stone supported upon brick pillars. It belongs to a larger, rural property. Between one of the home's outdoor walls and the path we discover a svelte hackberry over 10 m in height, presiding over a pleasant corner that invites you to feel tranquillity. LENGTH: 6.7 km. Circular route. INCLINE: flat, except for a minor ascent between the Pont de Fusta gully and Torrecarrals. 35 m of incline, followed by a light descent. DURATION: On foot: 1 h 50 min. Bicycle: 40 min. Variant that runs through the agricultural landscape surrounding the Alberca River and the Moya pine forest. The route runs through rural roads, most of which are asphalted, in addition to a stretch of the rail trail. The light ascent to Torrecarrals allows for enjoying the magnificent views. ATTRACTIONS: Agricultural landscape, Diluvi Olive Tree, Torrecarrals, monumental hackberry and Moya pine forest, an authentic Aleppo pine forest amongst orange trees, delimited by the Pont de Fusta gully. 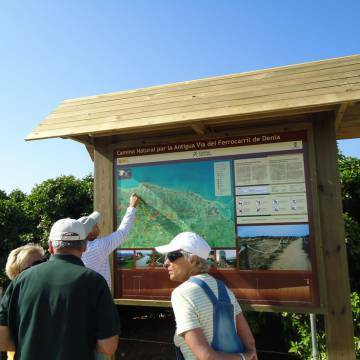 The route's starting point at Camí del Palmar presents a picture-perfect postcard, followed, in this order, by the Alberca River course, orange groves, Moya pine forest, and the Montgó in the background. Once we pass the Pont de Fusta gully, we ascend until finding the Diluvi Olive Tree, then continue until approaching Torrecarrals. At this point we enjoy views of Ondara, Vall de Laguar, El Verger, Segaria mountain, and the coastline with the Mondúver and Cullera mountains in the distance. We go around Torrecarrals along a dirt road on the left, where we will find the monumental hackberry. Here begins a light descent amongst pine trees and orange groves, continuing along Assagador del Palmar until connecting with the rail trail.